Verlieben Sie sich in unser charmantes Storybook Stone Cottage. Verrückt in der Liebe Unter riesigen Kiefern versteckt und direkt an einem Bergbach so nah, dass Sie schwören, dass er durch das Wohnzimmer rennt. Direkt vor dem Hauptdeck nehmen Sie die Brücke über den Bach, den Whirlpool und das "Bird House", ein kleines Steinhaus mit einem Schlafboden im zweiten Stock. (Alte und junge Gäste sind dafür bekannt, um das Bett zu kämpfen. Der einzige Nachteil ist, dass es kein Badezimmer gibt. Das Haupthaus ist ein perfekter Rückzugsort für 2 Personen, bietet aber Platz für 4 Personen. Die Küche ist eine Gourmetküche. Wärmen Sie Ihre Zehen auf den beheizten Steinböden, machen Sie ein Feuer im Steinkamin und tauchen Sie in den Whirlpool am Wasserlauf ein. Lassen Sie sich am Ende Ihres Tages in die bequemen Betten und luxuriösen Bettwäsche fallen, von denen die Gäste begeistert sind. Genießen Sie es, auf dem Soundtrack des plätschernden Gebirgsbaches zu schlafen, das Sie von jedem Teil der Hütte hören können. Dieses Häuschen ist Vickis Baby. Wir sind uns ziemlich sicher, dass Sie es genauso lieben werden wie sie. Die Küche ist mit allen wichtigen Features, die eine Viking Range, Sub-Zero Kühlschrank komplett ausgestattet, und alles, was Sie brauchen für Gourmet-Küche. Die Küche umfasst auch die Grundspeisekammer Artikel und Gewürzen. Rufen Sie uns für eine vollständige Liste. Es sei denn natürlich, Sie wollen einfach nur in Sundance zu den 5-Sterne-Restaurant zu Fuß nach unten. Oder bestellen Sie Sandwiches oder Pizza aus dem Feinkostgeschäft in Sundance. Wir haben auch einen großartigen persönlichen Koch, der mit einer kleinen Benachrichtigung verfügbar ist. I surprised my husband with this little get-a-way in the mountains for his birthday this year. The staff of Stewart Mountain Lodging were amazing and very accommodating. They had balloons and some prosecco waiting upon arrival. The place was clean and beautifully kept. As many others have said, we especially enjoyed the porch and the hummingbirds flying around. My husband ended up sleeping on the couch (no, he wasn't in trouble - haha) because he loved the sounds of the river flowing and the trees whistling at night. It was perfect white-noise for the baby as well. I slept on the main floor with our 6 month old son and the bed was comfortable, sheets were soft, but it is only a full size bed on the main level so fitting two adults on it was a little too snug for us (also another reason he preferred the couch). The kitchen is FULLY stocked with pots, pans, coffee, wine glasses, everything you need to host your dinners. We cooked every meal in the cabin or on the grill and it was surprisingly seamless. We really want to come back when our son is a little older and play more at The Hollow (the park nearby) and let our doggie do more diving into the river. Thank you again for opening your cabin to us so we could enjoy it and create memories there. We really hope to be back! Thank you Haley! Loved having you all for the surprise birthday and hope this becomes an annual tradition. We are happy you all enjoyed The Hollow and we are sure it's just a matter of time before your son will be flying across the stream on the zip line. Thank you again for loving the cabin as much as we do. Stay in touch. 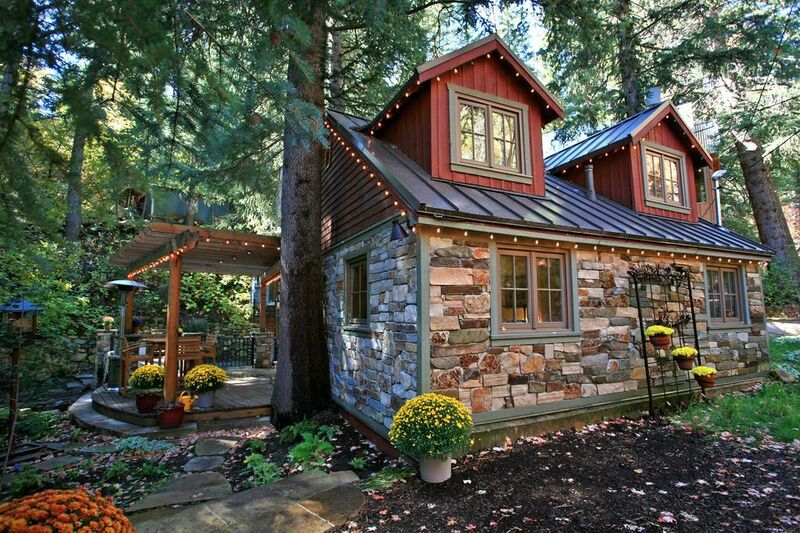 From the moment you arrive you will feel the magic and wonder of this adorable little cottage. The Mountain hosts have prepared this place so perfectly, that all you have to do is drop your bags and enjoy the serene, woodsy environment. Our family of 5 relaxed, recharged and reset our bodies and minds thanks to this fairytale cottage. Thank you Amy! It was great to have you as our guest at the cottage and it sounds like it was a good fit for everyone. I hope the kids didn't fight for who got to sleep in the birdhouse. We hope you will be back again soon. Stay in touch! This cottage was very cozy & cute, The kitchen was wonderfully appointed & the patio, hot tub & constant, soothing sound of the adjacent stream was heavenly. The cottage got a bit warm during our late July stay, but the property manager brought us a fan & all was well. Thank you Jennifer. We love sharing this cottage and happy it was fun for all. The stream and setting are wonderful. It was a warm weekend and sorry the home wasn't cool enough for you. We are happy the fans helped a bit. Thanks for sharing your feedback. This was such a dreamy place. Perfect getaway with my husband and two little boys. The owners were so committed to us having a great stay. They checked in several times and dropped off fresh bread and jam! Thank you for spending the weekend with us Jessie. We loved meeting all of you and wish you would have had more sun than rain. You're great sports and we can't wait to get you all back soon! Perfect in every way! A nice quiet canyon. The most beautiful ridge line in Utah. Heavy spring snow. A just loud enough stream babbling along. We used our cabin as a base camp for about a week while we explored Sundance, Snowbird, and Park City. Nothing beats this cozy, clean, and appointed to perfection cabin. We chose to spend each unscheduled minute here because it was truly a home away from home for us. The Stewart Mountain Lodging staff was absolutely superb. We cannot wait to come back! We can't wait to have you back again! Next visit, consider coming during our Summer or Fall Season. They are turning into our most popular times of year. Favorite activity is always wandering through our forest. There are so many trails. Second most favorite activity, just doing nothing, sitting on the deck, watching the stream flow by. We really hope Penny will be coming on your return trip, she might love us best! Be watching for a little gift in the mail for her. Thank you so much for the stay. Hope to see you back soon! Lage, Lage, Lage - 5 Minuten Fußweg zum Sundance Resort. Die Bilder sagen alles. Dies ist ein unglaubliches Steinhaus, direkt am Bach gebaut. Der Whirlpool ist verstaut, umgeben von einer Steinmauer auf der einen Seite und dem Bach auf der anderen Seite. Romantischer geht es nicht. Dieses Ferienhaus liegt auf einer privaten Gasse, abseits von jeglichem Verkehr oder Lärm - abgesehen von Naturgeräuschen - dem herrlichen Klang des Baches. Sie müssen diesen Ort sehen, um es zu glauben.